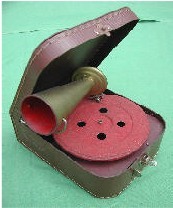 An exception to the above is the NIRONA, shown above, a quality German children’s gramophone. It was unusual in that a standard full size motor was used. A distinctive bell shaped “horn” is used which gives a surprisingly good reproduction. A much later gramophone was made in the 1960’s by Louis Marx & Co. of Swansea. 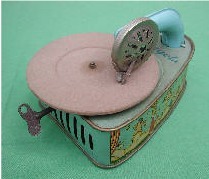 Although made of plastic and battery operated, it retains acoustic reproduction, uses steel needles and plays at 78 rpm. I would think that this was the last toy to retain these features. Does anyone know otherwise ? 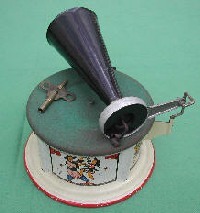 Plastic records were supplied by Marx for this gramophone under the Kidditune label. Most of these were cheaply produced toys and were only intended to play small records. 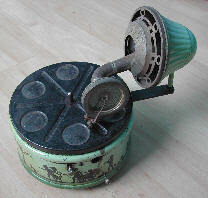 Nearly all had the most basic motors, similar to those found in toy trains. Some used a short trumpet style horn, whilst other used an internal horn. They were usually wound by a key, either through a hole in the side or an aperture in the turntable. One lever controlled the motor and you guessed the speed. There seem to have been two main types :--an attractively printed tin plate machine or a gramophone built into a small leather case. Ultra-flexible records. These were issued in vast quantities during the 1960’s & 1970’s. Most were free promotional records tempting you to buy sometime else. Eric and Ernie/Maltesers, Revels, Treets. 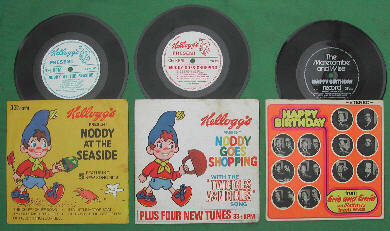 These were usually smaller than the standard 10 inch record and were made to be played on children’s gramophones.